Los Angeles Clippers star Chris Paul might be playing through a groin injury, but not without a flu shot. OAKLAND, CA: Los Angeles Clippers star Chris Paul might be playing through a groin injury, but not without a flu shot. Through a partnership with the NBA, Kaiser Permanente teamed up with two of the league’s most prolific point guards, Paul and the Golden State Warriors’ Stephen Curry, to get Millennials thinking about and taking charge of their health. The health insurance company has worked with Edelman in Los Angeles on the campaign to support Translation's creative efforts. 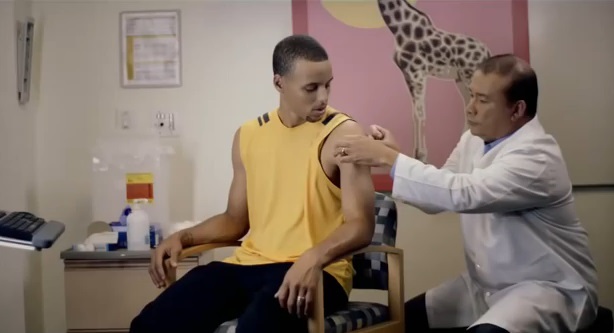 "[Millennials are] reaching the age where many are aging off their parents’ insurance, and they have to make decisions," said Diane Gage Lofgren, the company’s SVP and CCO, adding that using Paul and Curry was an easy choice because they are role models for "total health." As the March 31 open-enrollment deadline for 2014 coverage through the Affordable Care Act nears, Kaiser Permanente wants to remind young people to ensure they are covered, as well as to let them know they have access to information. The campaign is focused on prioritizing health as a lifestyle, including eating right, staying active, and maintaining healthy relationships in addition to being covered and knowing how to use benefits, said Gage Lofgren. She added that the campaign is present across media, including on social media and the radio. A YouTube video of Curry getting a flu shot was the campaign’s most-watched video of December, said Gage Lofgren. "We’ve had great engagement with what we’ve done. Being able to use these two athletes to talk about the tough flu season – they just do it so effectively," she explained. "Many Millennials may see themselves as invincible." Kaiser Permanente said it is planning to continue its relationship with Paul and Curry, and it is also looking for other ways to engage young people by tapping into their interests. In addition to its work with an agency, the insurance company also consults the young professionals on its own team as well as a multicultural business resource group, GenKP, which is made up solely of Millennials. This story was updated on March 15 to mention Translation's marketing work on the campaign.